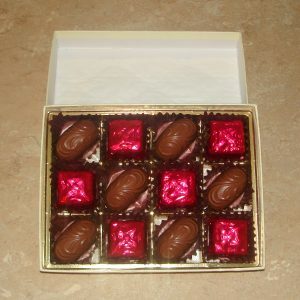 Chocolate Gift Box 1 is a nice smaller gift for someone looking to put a smile on someones face. You will receive 3 pieces of our peppermint creme filled chocolates and 3 chocolate creme filled chocolates. All boxed in a nice gift box with a beautiful bow. 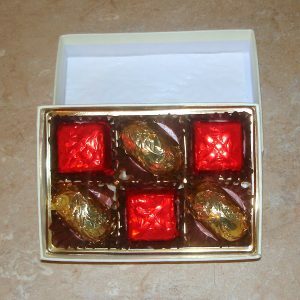 Total weight of chocolates is 7 oz.. Packaged in an attractive gift box with a beautiful bow.